Mammals have fur, a backbone, and are warm-blooded (regulate their own body temperature) 1. Most female mammals produce milk and give birth to live young (as opposed to eggs). 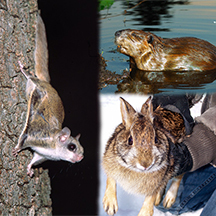 Common medium-sized mammals in Massachusetts include raccoons and skunks. 21% of the world's 5400 mammal species are threatened or recently extinct according to the International Union for Conservation of Nature (IUCN) . Primates are especially threatened 1.